We are excited to share that we are adding one more person to our wolf pack. 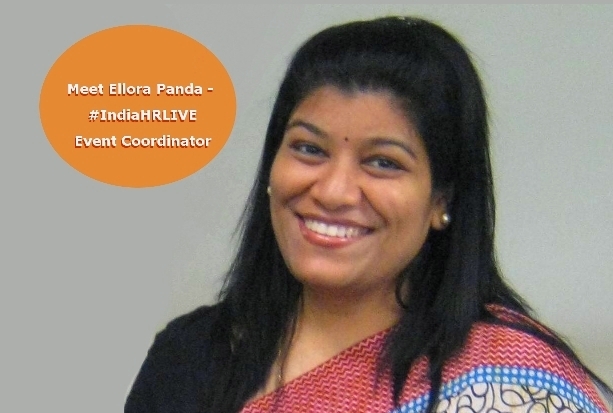 Ellora Panda has always been a wonderful friend and great ambassador for India HR LIVE since we launched. We were humbled to have her support. She has been introducing us to eminent guests and speakers and we are delighted to officially welcome her as our Event Coordinator. Hi, I am currently based out of Kolkata , heading the Management Development Function division for East Service Area in Idea Cellular Ltd , I am fond of reading and writing. Talking of movies, a big fan of Aamir Khan , some of my favourite movies randomly include A beautiful mind, Pakeezah. Beautiful yellow roses and chirruping of the sparrows in the morning excite me. IAm fond of my two squirrels at home[Bhubaneswar] who make me feel so connected and childlike. My cell is my lifeline and I can’t live without. Notes to myself by Hughes Prather has stayed with me till date..I really love reading it again and again. An active NHRDian , associated with Bhubaneswar chapter , it is exciting to see HR fraternity’s span reaching out to masses.. Advent of Social Media, the platform to leverage learning with Technology has been a great enabler. My myriad journey where many have walked with me in my journey, supported me in my endeavor and specially my late Grandmother[ Aai ]who always instilled that courage and belief that whatever be the circumstantial factors one’s contribution is to be progressive and constructive. None the less my support system of my family too plays a crucial role . An independent and supportive family environment, experience of studying, working and living in diverse cultural set-up, all ups and down faced during the journey so far have contributed to my making. Currently based out of Kolkata , heading the Management Development Function division for East Service Area in Idea Cellular Ltd.
What’s your game plan with India HR LIVE, why you do what you do here! Social Media is a platform and a forum for exploring new trends, know what is happening across globally and leverage this presence as a learning mode. India HR Live is such a wonderful platform to leverage learning..and as a team we could be catalysts of change..
Social media is constantly evolving. India HR LIVE is an excellent social community which offers multiple opportunities to learn, experiment and grow in HR. I am here to gain and share ideas, experiences and opinions with HR Industry leaders and peers. Among my favorite ones are Pakeezah, A Beautiful Mind, Barfi, 12 Angry Men …simply touch my heart, and connect. What is the one lame thing you are excited about! My morning Chintan ..My day starts with it. Reading is my favorite catching up in free time..List is endless but yes the ones that come out instantly to my mind are: Last Lecture by Randy Paush , Good to Great and Great by Choice by Jim Collins , Antifragile: Things That Gain from Disorder by Nassim Nicholas Taleb , Business Sutra : A Very Indian Approach to Management [my very recent reading of last week] by Devdutt Pattanaik. That HR has now been looked at as a Business Contributor and employee development is now the focus…Still it is disgusting to see HR is considered as non-functional in some sectors. Different perspectives build in a multi visioned point of view..and one needs to stay connected to know more about the blogger/writer..
Dear Ma’m … kudos !!! n the ‘download’ in your interview itself is a great starter !